As I'd mentioned in a previous post, the JFK 50-Miler has changed its start time, cutoff times, and qualifications. I did the math for you -- here are my revised cutoff times, along with the paces needed to stay just ahead of the sweeper in the JFK 50. It's my suggestion that (1) you run FASTER than this, and (2) don't rely on anything I'm saying. I'm putting this chart up as a GUIDELINE -- this race is on you to study, learn about, and prepare to run. If you use this chart and don't finish, it's on you, not me (sorry, I have to have that disclaimer in there). Learn the cutoffs. Press On. Always. Be. Churning. If you finish this thing, thank me sometime, willya? Note: This cutoff chart is a picture. Click it, then click "save as," and it will appear larger on your screen, if you wish to print/laminate/cry over. There's something I think every runner needs. Nope, it isn't shoes. After all, some people wear those shoes that look like feet ("feet gloves"). I even saw one guy at the JFK 50-miler walking to the start line sandals. It's not even wearable tech, although believe me, I'm old enough that when I started running in high school, it was a lot more cumbersome. Nope, the essential thing that every runners needs is a supporter. Yup, I went there. Yes, it's a cheap applause line. But it's also true. We need the support and patience of our friends/family/colleagues to put up with the long training hours, the near-CONSTANT talk of training/tempos, and worries of injuries, and just the general . . . nuttiness that comes with training for a long distance race. Plus, our supporters have to smile at us while we TALK about all this. That's gotta take effort. That's why this post is about things THEY can do while they wait for us to finish the CUCB 10-Miler. It will be a lovely Sunday in April, and rather than stand around looking at the piles of discarded clothing (which will be donated to shelters -- yay runners!) at the start line, why not suggest one of these three places to go visit? Each of my suggestions are less than 1 mile from the start/finish line, and aren't often mentioned as "Marquis" destinations to visit, so even if your supporters are locals, perhaps they'd enjoy visiting these spots. I've ranked them in degree of difficulty, even though Google Maps shows them all as nine-tenths of a mile away. 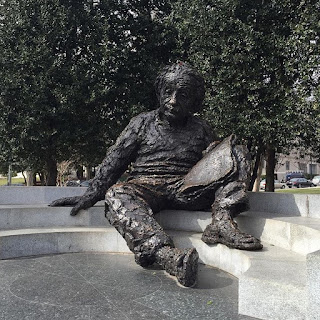 The Albert Einstein Memorial. Just walk along Constitution Ave., towards Lincoln, with the White House on your right. It's just before 22nd street NW. This is a great little gem that doesn't get nearly enough visits. It contains three of his most famous equations, along with three wonderful quotes from him. Sit in his lap, snap a picture, and come up with some puns about relative time while you wait for your runner to finish. 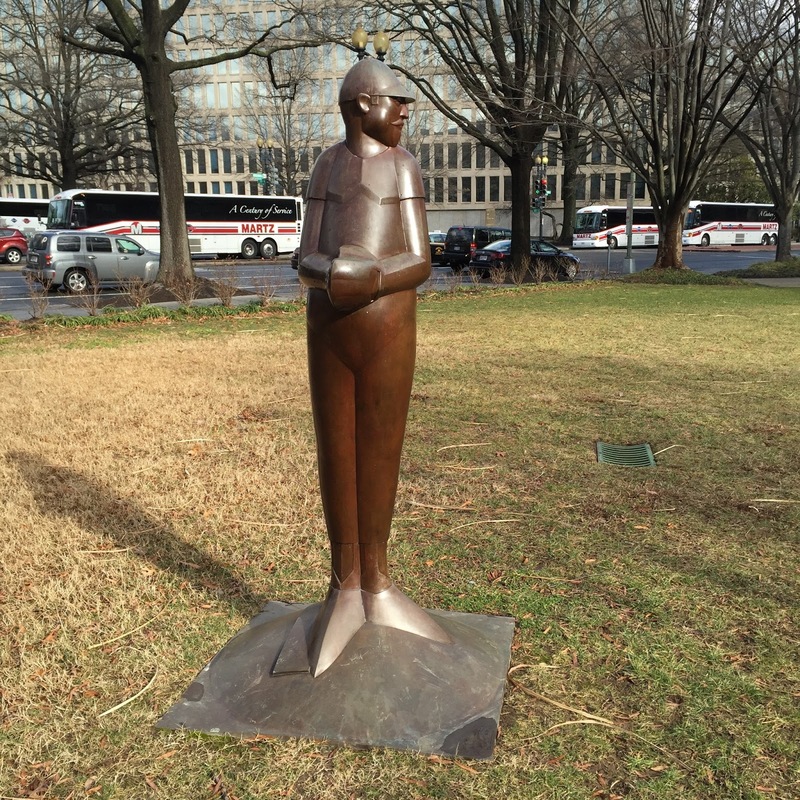 Walk along Constitution (this time towards the Capitol), and make a left turn on 6th Street -- you're there! 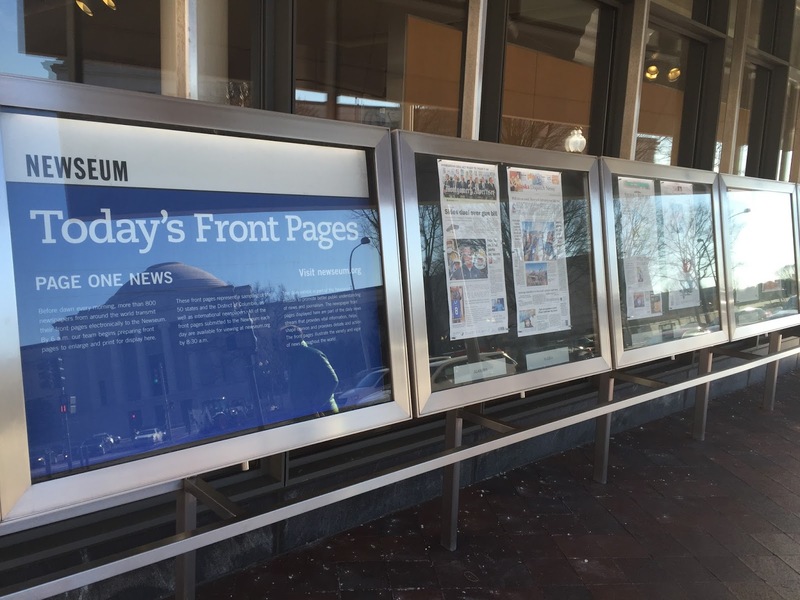 This is the Newseum, but not the actual place -- most folks have heard of it. But what many folks may not realize is that the outside, right along the front of the Newseum, is updated daily with the front pages from a major newspaper from each state in the U.S., along with several national papers, and even a couple of world-interest ones. This free(!) gallery is updated every morning, and if you've got out-of-town supporters coming down to see you start/finish, they are less than a mile from seeing a great cross-section of how different states are covering anything from politics, to what rates a big headline. 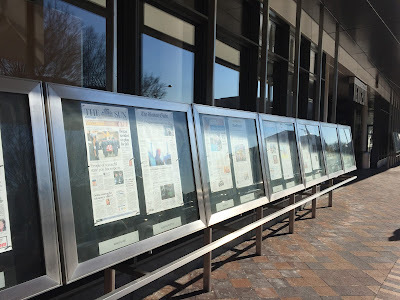 I'll sometimes review the papers after a morning run, and I'm surprised by the numbers of tourists who had no idea the papers were there until they arrived AT the Newseum. Bearing in mind this is still under a mile from the start, it's just a TOUCH harder to find, but in my mind the most unknown little gem. 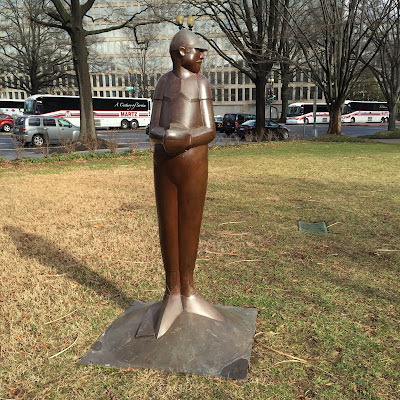 In a little park near the Federal Reserve Annex at Virginia Ave and 20th St. NW likes a sculpture called, "Full Count," by John Dreyfuss. 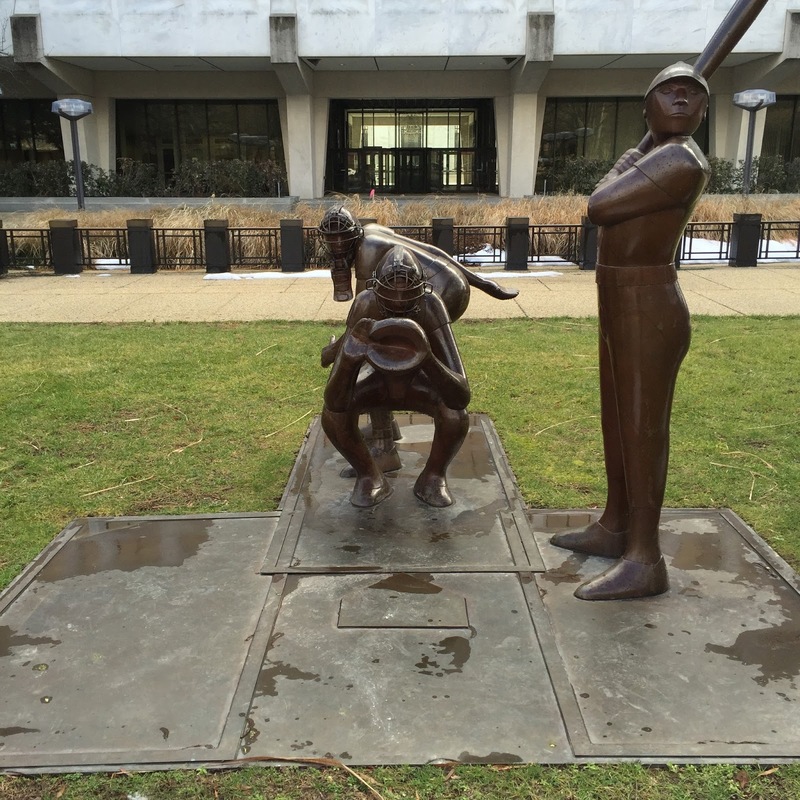 These are life-sized baseball players (and an umpire) set 60 feet 6 inches apart (the regulation distance from mound to home plate!). 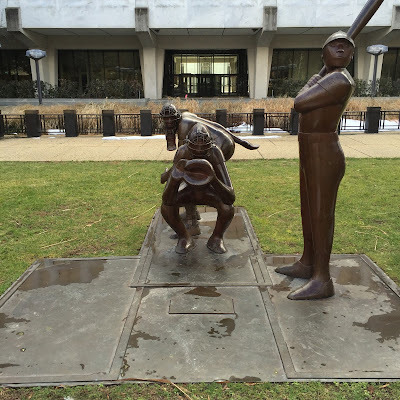 Let's face it -- the CUCB is "The Runner's Rite of Spring," but another spring tradition is Opening Day of baseball! 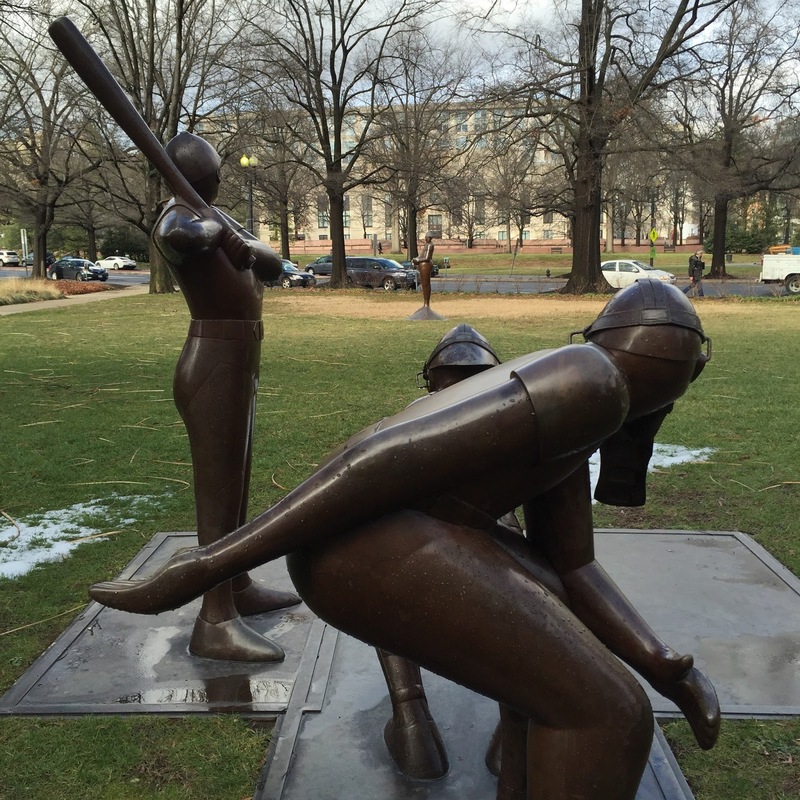 The detail and contours of the figures are fantastic, and I guarantee you most tourists will NOT know this setup is so close to the National Mall. Show up, check them out, and you'll still have time to appreciate how far Max Scherzer has to throw a ball 100+ times every 5 days. Maybe it will even let you live out those "What if I threw out a first pitch?" fantasies?! Yeah, maybe just stick to yelling at the Ump instead . . . Anyway, if you've got supporters coming out to the race, either pre-start, or coming down to see you finish, suggest one of these three lesser-known spots to check out while they wait for you -- or make an effort to walk by one of these spots as you head off to a victory brunch post-CUCB! Best of luck, and GO NATS! As a Cherry Blossom 10-Miler Ambassador, one of my tasks is to contribute a blog post here and there. We recently did, using Valentine's Day as the premise. Tai: Despite only recently writing a love letter to Yasso 800 workouts (really more of a diary), running has been an early first love. I have loved running from the time I was an early teen living in Myrtle Beach, SC. It was just something I could do in high school, and it didn’t require friends to do it (which was lucky because I didn’t have a lot of those). I loved running because all I had to do was put on my sneakers, or, coming from a rather poor family after things took a turn south, I would often run barefoot on the beach. Running was free. The beach was free. I knew the mileage between a certain beach access and a giant hotel, and would go multiple times per day, even as late as midnight. Seagulls and sandpipers didn’t make fun of me, and didn’t deride me. They just scattered as I approached (come to think of it, in that way they WERE like the people I went to high school with!). I love running because although running can be expensive, it doesn’t have to be. It is, and when done right, makes you feel: free.